Friends, Romans, Online Daters Lend Us Your Ears: Shakespeare Hath Taken Over the Popular Dating Site Zoosk! ‘Who ever loved that loved not online?’ Now Zoosk members shall woo with sweet words from the Bard of Avalon himself. Zoosk, a leading technology-driven online dating company that provides personalized matches, today released its new Shakespearean-language experience to help its 33 million members find in their hearts “the courage to make love known.” As dating has become more on-demand, the timeless art of writing a great love letter is in danger of being lost. To wit, Zoosk has partnered with one of the world’s greatest poets and playwrights, because “the course of true love never did run smooth,” and Shakespeare’s words may help determine whether a user’s next date is “to be or not to be.” In addition to Zoosk’s 25 language translations, the Shakespearean version will act as a playful example of how the love lessons and romantic language of the past can help members meet someone today. While using the Shakespearean version of the Zoosk website, members can say “aye,” “nev’r” or “mayhaps” to matches, see who hath gazed upon them, get set up by fate, send missives and amorous tokens to the people they’re wooing, increase their profile visibility by raising their status and add new likenesses to their profiles. The new translation also presents some of Shakespeare’s famous advice on love and life within the context of online dating. As members connect with each other on Zoosk they’re shown tips straight from the lines of Shakespeare about how to be successful while looking for that special someone. By bringing Shakespeare’s language of love to the online dating experience, Zoosk hopes to provide a fun reminder that though the ways people meet and “woo” may look very different today, the feelings and the sentiments involved remain the same. The Shakespearean version of the site is available on Zoosk’s web platform on April 1, 2015 and to Zoosk members who have their language preferences set to English. For more details, visit www.zoosk.com. Zoosk is a leading online dating company that learns as you click in order to pair you with singles with whom you’re likely to discover mutual attraction. Zoosk’s Behavioral Matchmaking™ technology is constantly learning from the actions of more than 33 million members in order to deliver better matches. With the #1 grossing dating app and a top 25 grossing app on the iPhone in the United States, Zoosk is a market leader in mobile dating. 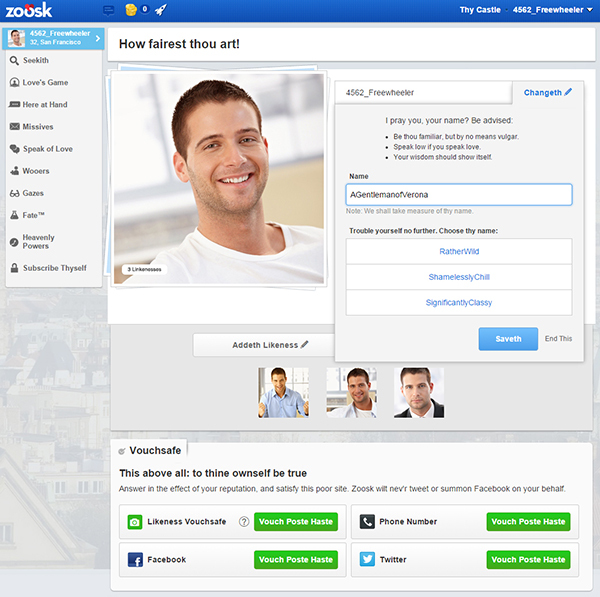 Available in over 80 countries and translated into 25 languages, Zoosk is a global online dating platform. Zoosk, Behavioral Matchmaking™, Carousel, First Comes Like™, SmartPick™ and the Zoosk logo are trademarks or service marks of Zoosk, Inc. All other trademarks, service marks or names mentioned are the property of their respective owners.